Hello everyone, and welcome to this week’s edition of the Tiggerific Tuesday Trivia! I am pleased to join in the blog hop with my friends Jodi from Magical Mouse Schoolhouse, Jenn from Disney Babies Blog, and Heidi from Heidi’s Head! Today we are taking a look at trivia from This Day in Disney History! The Year was 1938. 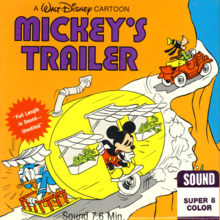 The Cartoon Short was Mickey’s Trailer. The characters in this trip across the country: Mickey Mouse (voice by Walt Disney), Goofy (voiced by Pinto Colvig), and Donald Duck (voice by Clarence Nash) sorely regret their decision by the time it is all over! You can see what I mean for myself in the YouTube video below! Enjoy! Now that you have seen my entry, please make sure you take a look at the entries that everyone else has for you! Thanks, and have a great day! Tiggerific Tuesday Trivia – Goofy Teaches Golf! That is so cute! Thanks for sharing, Mike! Oh love these shorts! On our last cruise our son loved watching these so much that he had to buy a few to have on the ipad. Seems this type of humor never goes out of style. Thanks so much for sharing! Looking up old Disney shorts in youtube has become a new “thing” at our house! Thanks for sharing! I love that short! Thanks for sharing and hosting! Previous Post: Free Disney Dining Released for Disney Visa Cardholders! Next Post: 44 Days til Disneyland – Pixie Hollow!